Located in Yancey County in the western part of North Carolina, Mount Mitchell is the highest peak in the Appalachian Mountains. Mount Mitchell is part of the Black Mountain range and is part of the Mount Mitchell State Park, with the Pisgah National Forest all around it. Mount Mitchell also has the distinction of being the highest mountain in America to the east of the Mississippi River. In the past, Mount Mitchell was known as Black Dome due to its dome-like shape and location in the Black Mountains, but the name was changed in honor of Elisha Mitchell, a University of North Carolina professor who explored the area in the mid-19th century and discovered that the Black Mountains were higher up than Mount Washington in New Hampshire, which was previously believed to be the tallest peak east of the Rockies. A road runs almost all the way to the top of Mount Mitchell via the Blue Ridge Parkway, allowing almost anyone to reach the top and enjoy the beautiful views in all directions from the recently constructed observation deck. A 40-foot (12 m) tall observation tower used to be situated at the summit but was taken down several years ago. A plaque can also be found at the top of Mount Mitchell to denote its elevation, along with the tomb of Elisha Mitchell, who actually died on the slopes of Mount Mitchell during an expedition to verify the mountain's height. Elevation is a key term when speaking about any mountain as it shows how high the mountain's peak is in relation to sea level. Elevation should not be confused with prominence, which is another geographical term that refers to the height of a mountain from its lowest contour line to its peak. The prominence of Mount Mitchell is 6,089 feet (1,856 m), while its elevation is 6,684 feet (2,037 m), so the prominence of this mountain is quite similar to its elevation. Mount Mitchell also has an isolation of 1,189 miles (1,914 km), making it one of the most isolated peaks on the planet and fourth most isolated in all of North America. Other mountains in the Black Mountain range include Mount Craig, which is the second highest peak after Mount Mitchell and has an elevation of 6,647 feet (2,026 m), Balsam Cone, which has an elevation of 6,611 feet (2,015 m), The Pinnacle, which has an elevation of 5,665 feet (1,727 m), Big Tom, which has an elevation of 6,581 feet (2,006 m), and Celo Knob, which is the northernmost major peak of the Black Mountains and has an elevation of 6,327 feet (1,928 m). Like with other major mountains and hills around the world, the high elevation of Mount Mitchell has a direct effect on its climate. As we go up in elevation, the air becomes thinner and colder, resulting in higher chances of snow and sub-zero temperatures. The temperature at Mount Mitchell frequently drops below freezing point from November through to April and huge amounts of snow can fall during these months of the year, with around 91 inches falling annually. The mountain also sees over 74 inches of rainfall throughout the year and can be subject to regular storms. North Carolina is one of the lowest states in terms of elevation, with a mean elevation of just 700 feet (210 m), despite the presence of major mountains like Mount Mitchell. The lowest point in North Carolina is the Atlantic Ocean, which is naturally at sea level, and the highest incorporated community is Beech Mountain, a small town that crosses the border of Avery and Watauga counties and has an elevation of 5,506 feet (1,678 m), making it the highest town east of the Mississippi River and the Rocky Mountains. Mount Mitchell’s elevation is more than one thousand feet higher than the elevation of Beech Mountain. Major cities in North Carolina include the state capital of Asheville, which has an elevation of 2,134 feet (650 m), Charlotte, which has an elevation of 751 feet (229 m), the state capital of Raleigh, which has an elevation of 315 feet (96 m), Greensboro in Guilford County, which has an elevation of 897 feet (272 m), and Durham, which has an elevation of 404 feet (123 m). 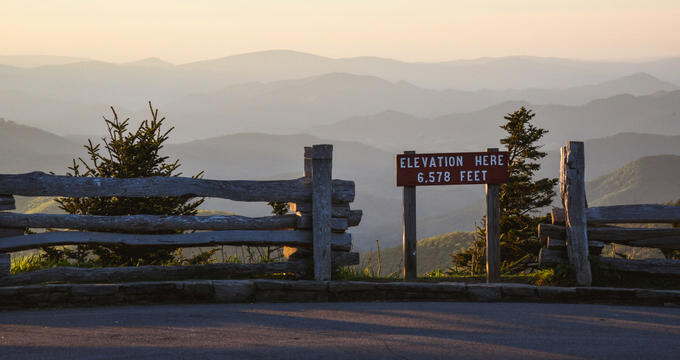 The elevation of Mount Mitchell is naturally several thousand feet higher than all of the big cities and towns of the state of North Carolina.